← What does customer service mean in higher ed? Since 9/11, one of the most annoying, but necessary, things about air travel is going through long security lines and being treated like you are a potential security threat. Still, most of us are now accustomed to removing our jackets and shoes, going through body scans, and sometimes getting patted down by dour-faced TSA agents. In fact, it’s become normal and acceptable that TSA agents are less than friendly as they focus on processing thousands of people in airports and ensuring our safety every day. So, imagine my surprise when I was in the Dallas airport returning from a business trip last month, and my experience was vastly different. I handed a TSA agent my boarding pass and ID and she gave me a big, warm smile and said, “Good morning! How are you this beautiful day?” Her attitude and smile was contagious. I smiled back and said, “I’m doing well. And I really appreciate your friendly smile.” Her smile widened into a big grin and she said to me with a knowing look, “Honey, it calms the crazy!” At that I laughed and went through the rest of the security line, noticing that all the TSA agents there were different than I had experienced elsewhere. They were doing their jobs competently and efficiently, but they were all smiling. They took extra care to interact with people in positive ways. And most importantly, people flying out that day responded in kind. The mood was lighter in that line and people seemed much more tolerant and patient. On my flight home, I was pondering that experience and wondered: What kind of leader do they have, that they were approaching their jobs with such positive attitudes? As Todd said last week, one of the behaviors that contributes to exemplary customer service is demonstrating a positive attitude. The TSA agents at the Dallas airport were doing that in spades. Positive attitudes can do wonders when we interact with customers, no matter what business we’re in. 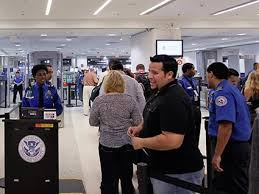 A simple smile and warm greeting, like the TSA agent said, can “calm the crazy.” It can also leave our customers with a desire to do business with us again and to recommend our colleges and universities to others. So, for me, it begs the question: What can we do as leaders to ensure that the staff and faculty we lead in our colleges and universities demonstrate a positive attitude when working with students, community members, colleagues, or any other potential customers? This entry was posted in customer service, self awareness and tagged customer service, positive attitude. Bookmark the permalink.